in the basement of our building there’s a door – a heavy metal door with a submarine-type locking wheel. curious as to where it would lead, one day we turned the wheel and opened the door… only to find that it was an entrance to the basement of the building next door. my teacher once explained to the class that these were remnants from years of war and tension: the doors were there to give people an emergency exit, in case something happened and they needed to find another escape route. the buildings in berlin are often built side by side, in closed squares, with an inner courtyard – it makes sense that they’re somehow connected. berlin is a complicated city, its history deeply fused with the wars and historical events that took place here. you can learn about it in the museums and memorials, but there are a lot of things, some big and some small, that you don’t often get to see. there’s a curious side of it that is especially hard to access: the underground world. we’ve all heard of the bunkers and tunnels that used to run below the city’s surface… but where are they? what were they used for? what did they look like? 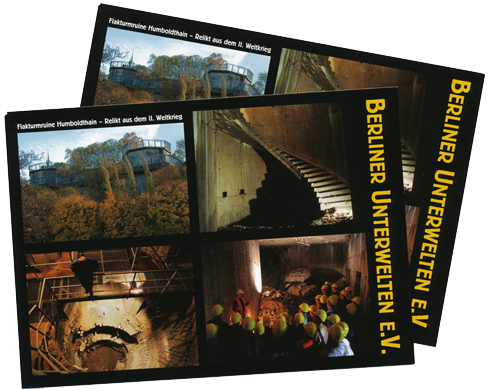 interested in revealing the stories of these hidden worlds, a society was formed in 1997: the berliner unterwelten. 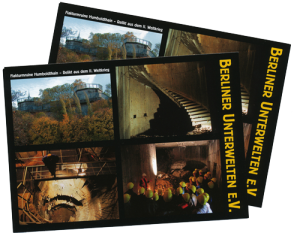 they focus on discovering and recovering forgotten underground structures, and on recounting history from their perspective. so far, we’ve done a couple of their tours, and cannot recommend them enough. one of these tours is to an intact underground bunker, which lays just next to a busy metro and railway station. as you sit in one of the airtight, low-ceiling concrete rooms listening to your guide and looking at the fluorescent stripes on the walls (that still glow in the dark), you get an unusual glimpse at the lives of frightened and exhausted berliners, sitting in this same benches 67 years ago, waiting for the air raids to stop. i know it sounds gloomy – but that’s the history of berlin. these tours do an exceptional job at portraying it, making it less boring, and a lot more hands-on. i can’t wait to do the rest of them! posted in in germany | July 22nd, 2012 | comments?